Pull up your chair, a rocking chair if you have one, and give an ear or two to a sound the likes of which you've probably never heard, nor will ever forget. Welcome to the music of Roscoe Holcomb, courtesy of John Cohen and Smithsonian Folkways. Let your mind wander to the Appalachian Mountain region of eastern Kentucky - Daisy, Kentucky to be exact. 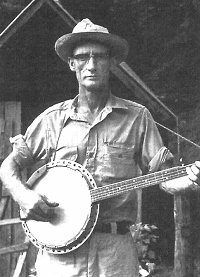 There, at the end of a holler on his ramshackle porch, "banjer" in hand and looking off and beyond the mountain tops, once sat a rangy fellow by the name of Roscoe Holcomb. Body ravaged through years of work in the coal mines, farming, and such, Holcomb would sit on his porch, pick his guitar or pluck a banjo, singing the songs of his surroundings in such a fashion that totally clashed with the coming tide of modernism. Bob Dylan once commented that Holcomb "... has a certain untamed sense of control, which makes him one of the best." That sense of control, vocally, derives from his participation in the Old Regular Baptist church and, later, the Holiness church. The Baptists forbade musical instruments; and since Holcomb grew fond of string instruments and harmonica, he drifted to the more musically adventurous, boisterous Holiness church. Cohen first met Holcomb in 1959. The 12 recordings he made during that initial meeting were released in the Smithsonian's Folkways album 'Mountain Music of Kentucky' - his first exposure to music fans beyond the Kentucky hills. Bluegrass pioneer Ralph Stanley, who in 1966 toured Germany with Holcomb, noted "you could feel the smell of woodsmoke in that voice." Subsequent recordings were made in 1961, 1964, and 1974 - tunes that comprise The High Lonesome Sound. Despite the fact that Holcomb recorded, and even performed a few noteworthy concerts, he is not to be confused with his more commercial fellow eastern Kentuckians. Acclaimed, professional artists such as Grandpa Jones, The Osborne Brothers, and Bill Monroe all came from the same region, yet unlike Holcomb they intended to be stars. Holcomb merely performed for the pure joy, whether for an audience of people or pines. For someone simply content with singing his lonesome songs to himself, Holcomb nevertheless traveled to many, for him, strange places, performing at folk and bluegrass festivals, beginning with a 1961 trip to perform at the University of Chicago Folk Festival, followed by a concert in New York City. He performed at 1962's Berkeley Folk Festival in California, the UCLA Folk Festival the next year, and toured Germany, Switzerland, Sweden, and London with the Stanley Brothers, Cousin Emmy, and The New Lost City Ramblers. He last performed publicly at the Brooklyn Academy of Music on May 7, 1978. The eery sound of his voice somehow fit his environs. Smithsonian's Cohen, in 1962, coined the term 'high lonesome sound' to describe Holcomb's sky-piercing mountain tenor. The description has since become attached to Bill Monroe's high tenor and, in general, much of bluegrass. But it was Holcomb who fully and most accurately embodied the description. It was an apt description. The 21 tracks on this CD come without recording industry pretensions and expectations; the music is purely from one man's aching, passionate soul. The songs derive mostly through the long-held (though fading) Appalachian tradition of passing songs from generation to generation, hearkening to a time when television had yet to invade the lives of rural folk and work and tradition were about all they knew. The outside world, somewhere beyond the hills that gave birth to Holcomb, must have seemed a million miles away. Songs such as an acapella Moonshiner and House in New Orleans give insight into Holcomb's more audacious side, while gospel tunes like In the Pines and Motherless Children show the mountain man clinging valiantly to deep-rooted spiritual beliefs. He did not create the tunes, but he sure lived them. Draw near as Holcomb, blue as the mountains, exposes his pain on Trouble in Mind. The oft covered tune fits perfectly in its imperfections with Holcomb, a man who, despite his dire lot in life, nevertheless clinched tightly to the song's positive note that "The sun's gonna shine on my back door someday." Gaze into the sunset as you listen to Old Smoky, look toward the hills and try to capture a bit of the essence of what Holcomb emotes. Feel your spine tickle and tingle? Imagine living the life that he led - after a listen it won't be too difficult. Holcomb had a way with honesty and description that all but fell from the sweetly jagged notes of his voice. Holcomb never recorded professionally nor had the desire to do so. Fortunately, Cohen recorded the indelible Kentuckian, giving music fans a rare glimpse of someone who had simply wanted to carry on a tradition of music that he felt was fading. Holcomb, body wracked with asthma and emphysema, died in 1981 at the age of 70. So, as you sit there, rocking as Holcomb once did, listening to the tunes he once played for his mountain enclave, try to shake their sounds from the midst of your memory once the last of them has finished. It's impossible. Roscoe Holcomb, with but a banjo and wondrous voice, will climb into your very being and create an image that mere music rarely does.